Is there such a thing as the perfect garage floor tile? Garage Flooring LLC thinks there might be when they posed this exact question with the release of their new TrueLock HD Extreme interlocking tiles earlier this year. Needless to say, this question caught our attention and led us to eventually review these tiles to see how perfect they may be. 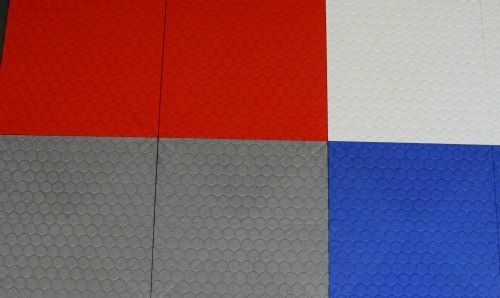 Undoubtedly, one of the fastest growing segments in garage flooring today is interlocking garage tiles. Also known as modular garage flooring, nothing can create a custom looking garage floor faster and with no experience necessary for their easy installation. As a result of this fast growth, manufacturers and vendors have been expanding with color selection, finish and more importantly, the design of the surface of the tiles. If you are not familiar, we suggest you read our article about interlocking tiles to learn more about them and how they work. They really are a modern marvel that is becoming extremely popular. What Makes the TrueLock HD Extreme Garage Tiles Different? Like many of its competitors, TrueLock HD Extreme tiles are made in the U.S.A. and are constructed of a high-impact polypropylene plastic with a strong hollow core underside construction. This construction allows for both air movement and drainage under the tile. Available in up to six different colors, they are 12”x12” in size and 1/2″ thick with a patented peg and loop locking mechanism that makes them easy to snap together. Both tiles come with a 10 year limited warranty. What make these tiles different from the competition, however, are the two different surface patterns that are available. These patterns are the coin top design and the diamond plate design. While these types of patterns are not new, the actual design detail of the patterns is. The TrueLock HD Extreme Coin is, as the name implies, a coin-top design with a raised round surface that resembles coins. What makes it unique though, is the smaller shape and texture of the raised surface. The smaller than standard coins allow for an increased surface area of the tile which results in a much smaller gap or valley between coins. This smaller gap provides for a smoother rolling surface for tool boxes, creepers, rolling tool trays, chairs, or anything else with wheels. You can see an example of the difference in size of the coins in the image below. The tile on the left is the industry standard coin tile. This particular one is GarageDeck from Big Floors. The tile on the right is the TrueLock HD Extreme Coin. As you can see, there is a big difference in the size of the coins. The standard coin is about the size of a quarter while the TrueLock design is the size of a penny. This design creates a much larger contact surface. You can also see how we placed a penny in the gap between coins of the standard sized coin tile. It is this large gap that can cause wheels to bounce around as they roll across the surface. In addition, there is also a difference in the texture of the coins. Most coined garage tiles have a smooth surface whereas the TrueLock HD Extreme Coin has a fine textured surface. This finely textured surface helps with grip in slippery conditions. The TrueLock HD Extreme Diamond is of course a diamond top tile. What makes it different from other diamond tops? To be honest, when we first looked at it we didn’t see anything that immediately stood out to us. It had us scratching our heads about what made this design special. We then pulled out some diamond top samples from other tile manufacturers that we had on hand so that we could compare. It quickly became obvious what the difference was. Like the coin top tile, the diamonds are smaller than all the other samples we had. As with any tile surface design, there are always compromises or cosmetics to consider. The one compromise with most diamond tiles is that they are not the smoothest for smaller wheels to roll over. As an example, have you ever pushed a shopping cart over those yellow truncated bumps where the sidewalk ends and a street crossing begins? Well, rolling a tool box, creeper, floor jacks or other small wheels over some diamond top tile can have a similar effect, though not nearly as intense. The concept behind these smaller diamonds is to provide a smoother rolling surface while still providing the popular look and grip that makes this design so popular. This is something that we were eager to try out for ourselves. Now that you know what makes these two tiles different from the competition, can they really be the perfect garage tile as the question suggests? We were aware that the TrueLock HD Extreme tiles were fast becoming popular after their introduction. So when Garage Flooring LLC offered to send us some samples to review for ourselves, we were quick to accept. To our surprise, we didn’t receive one or two samples of each tile. Instead, we received a box of samples that included four tiles of each color for each design. This was great as it would allow us to conduct some real world tests and to get a better idea of how these tiles looked and performed when snapped together as a small unit. The first thing we did was assemble a small pad of each tile surface design so that we could get a better idea of how they looked. We were able to create a 6’x4’ pad for each design. Right away we noticed that the fine textured surface of the HD Extreme Coin provided somewhat of a matte finish. It was actually a nice look that contrasted with the glossier areas between the coins. The HD Extreme Diamond has more of a semi-gloss finish due to the fact that it does not have the fine textured surface. In full disclosure, we have always been a fan of the diamond top tiles when opting for a solid top surface. These tiles definitely had a premium look to them that we immediately liked. Something else we noted once all the tiles were snapped together was the very small gap between each tile. The reason we picked up on this right away is that the garage we were using for testing and taking pictures has a RaceDeck interlocking tile floor that we are currently subjecting to a long term review. It had a tighter looking finish and is why we noticed a difference. Truth be told, we may not have noticed this if it wasn’t there for immediate comparison. This small gap between the tiles is just cosmetic and has nothing to do with the structural integrity of the tile or locking mechanism. 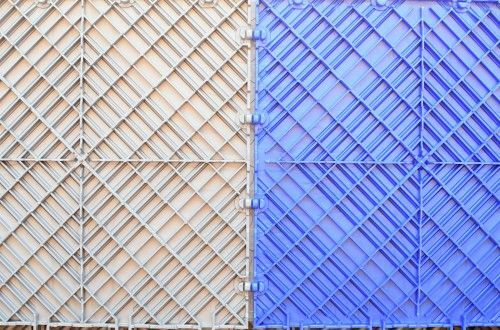 Hard plastic interlocking tiles can expand when they get warm. This is why they need to be installed approximately 1/2” away from all walls or objects that do not move. This small gap between the assembled tiles may allow for some of that expansion and tighten up during warmer weather. 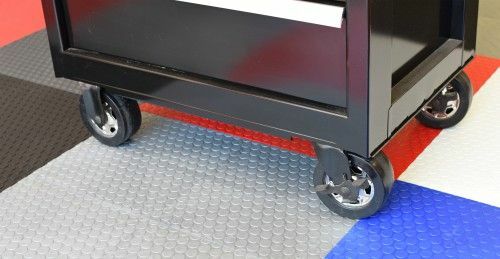 Small wheels will react differently as they roll across interlocking garage flooring, with some surface designs allowing wheels to roll much better than others. We wanted to conduct a roll test across each surface of the HD Extreme tiles to see how well small wheels reacted since this was one of the priorities when these tile surfaces were designed. 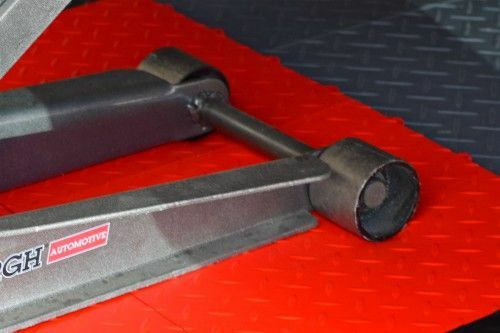 I’ll admit that roll testing smaller wheels may not be as big of a concern for some people, but for others who tend to work on vehicles and other projects in their garage, how well things roll or not roll across the floor can be a deal breaker. Note: If rolling small wheels on the tile isn’t a big concern for you, then just scroll down to our next section on load testing. For our first test we used a large rolling tool box. We pulled it up onto the HD Extreme Coin tiles and immediately noticed a difference. Though heavy at just under 400lbs, it was actually easier to push and pull due to the smoother transition of the wheels over the small coins. 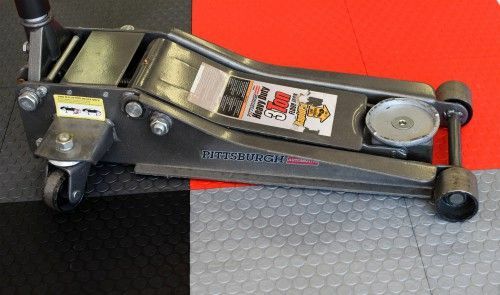 While not as smooth as running on concrete, it didn’t jingle like a wind chime nearly as much from tools bouncing around inside like it does on the current diamond top flooring where it resides. We then rolled the tool box on the HD Extremem Diamond tiles. It didn’t roll as smooth as the coin top, but we have to admit that it was smoother than the RaceDeck tile and it did not jingle as much either. The smaller diamond design is definitely showing its advantage here over other diamond top tiles. A 3-ton steel floor jack was our next subject. Now this jack sounds like a rattle trap when rolling over most anything else. On the HD Coin tiles it hardly made noise and again, it was easier to move around. Rolling the jack on the HD Extremem Diamond tile did create some noise, but just like the tool box test, the noise was less compared to other diamond top tiles we have subjected it to. A creeper is another item that we spend some time on. Nothing is more irritating than having to force it around when under a car due to the wheels not wanting to roll smoothly over a surface. Our Dog Bone creeper has larger polyurethane wheels and rolls fairly well on interlocking tile surfaces without too much effort, though it can be a little bit bumpy. Lying on the creeper and rolling around in different directions on the HD Extreme Coin was noticeably smoother with no worries of wheels hanging up. When we rolled on the creeper across the HD Extreme Diamond tile it was smoother than what we anticipated, though not as smooth as the coin top. We have no worries of it being difficult to move around while under a vehicle and it won’t rattle your bones when you do. Lastly we tried the office chair. I know at this point that some of you may be wondering what an office chair has to do with garage flooring, but more people than some may realize have rolling chairs and stools in a working garage. In short, we had zero issue rolling this chair on both the HD Extreme Coin and HD Extreme Diamond. We are confident that you will not have any problems with small wheels on either of these tiles. Is it as smooth as concrete? No, only a smooth levant tile design or the newer vinyl top tiles will provide that. What we can say though, is that the HD Extreme Coin is the smoothest rolling interlocking tile with a textured surface that we have ever tested. It really is an impressive design in that regards. 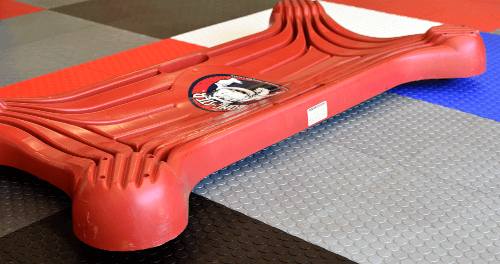 How much weight interlocking garage floor tiles are rated for and how they withstand the weight always creates some controversy and misconceptions. 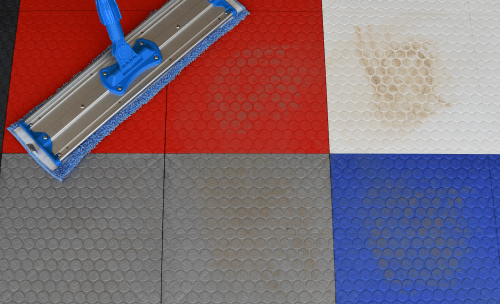 Most manufacturers will rate their tiles for maximum rolling weight, while others will also rate them for maximum pounds per square inch as well. The engineering of the underside construction is what determines this weight. We examined the underside structure of both tiles and immediately recognized the design. It’s the same high density substructure that the manufacturer Snap Lock Industries uses on many of their premium American made tiles. 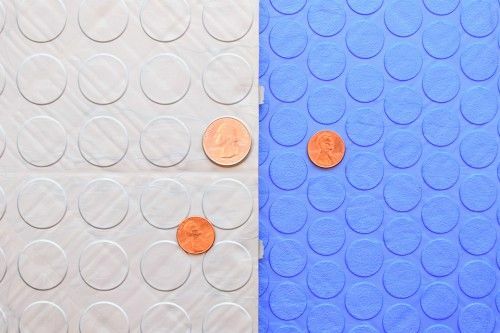 The image below shows the underside of the Big Floors coin top tile on the left that is manufactured by SnapLock Industries and the TrueLock Coin tile on the right. They are identical and reveal to us the high quality manufacturer of the TrueLock HD Extreme tiles. TrueLock HD Extreme tiles are rated for a maximum rolling weight of 36,000lbs. So, unless you plan on parking something larger than a firetruck in your garage, they are more than capable of withstanding the weight of your vehicles. The key with any brand of plastic interlocking tiles is to make sure that you don’t place any heavy items on the tile that have an extremely narrow foot print. For example, a heavy machinist table with angle iron legs provide for an extremely narrow foot print. While this works fine on concrete, all that weight on such a small point of contact will dent or damage any plastic interlocking tile. Jack stands with small angle iron feet is another example. They will punch a hole in the tiles when you place the weight of a car on them. It’s similar to what a small woman in stiletto heels can do to wood floors. However, just a flat 1.5” square or round foot pad will support hundreds of pounds of weight due to the increased surface area. Increase that one small leg to three or four and you will see that weight is rarely an issue with interlocking tiles when using the appropriate flat foot. 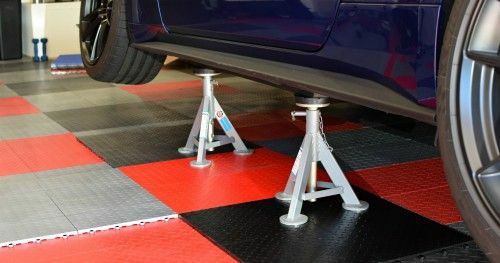 In order to provide an example of this and to test the tiles at the same time, we jacked up one side of a 3,800lb vehicle on the HD Extreme Diamond tiles and placed two Esco jack stands under the car to demonstrate. As you can see from the image below, the tiles were not affected by 1,900lbs of weight on just two jack stands that are a tripod design. We expected these results. A flat foot pad makes all the difference. 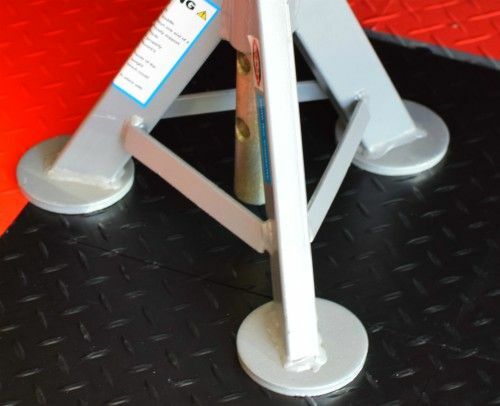 It is best practice to use a small piece of plywood under a jack when lifting vehicles on interlocking tiles since jack wheels are round and not flat. The small piece of plywood distributes the weight nicely. However, out of curiosity we wanted to see how these tiles would perform without using the plywood. As you can see from the image below, the tiles did deform under the weight of the round wheels. This wasn’t surprising as even higher weight rated interlocking garage tiles will deform somewhat under the same test. If you look close, you can see the wheels sunk into the tile and the jack frame resting on the surface. The point we are trying to make here is that if you use some common sense, there shouldn’t be much concern about placing heavy items on plastic garage floor tiles. They are much stronger than you may be aware when used appropriately. 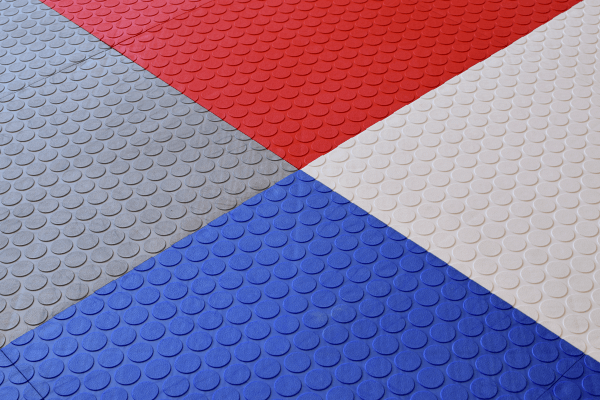 Most plastic modular garage flooring is extremely resistant to staining and the TrueLock HD tiles are no different. We subjected a couple individual tiles to grease, anti-seize compound, oil, gasoline, and even some tape residue. They all cleaned up with no evidence of what we assaulted them with. In our experience, about the only thing that can leave a slight stain on plastic tiles are certain types of tires. They can leach plasticizers that leave a dark brown or black tire mark on lighter colored tiles. We have found though that on most occasions these marks will clean up with some Simple Green and a little scrubbing. Next, we conducted a cleaning test. Again, we already know how easy it is to clean most plastic garage tiles. However, with the combination of the larger surface area and finely textured coined tops, we wanted to see if the HD Extreme coin design would create any issues or make cleaning more difficult. 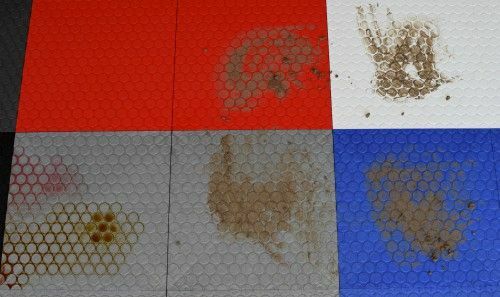 For our test we rubbed gritty mud on four different tiles and then applied used motor oil and transmission fluid to another. We let the fluids sit and the mud dry for 24 hours and then we checked how it would all clean up. Dried mud, used motor oil, and transmission fluid after 24 hours. We first wiped up the used oil and transmission fluid with an old towel. We then spayed a little Simple Green to the tiles and finished it off with the towel again. You couldn’t even tell anything had been there. Next we swept up the heavy dirt with a broom. As you can see in the images below, there is still some dirt that is embedded in the fine texture of the tiles. After sweeping and wiping up oils with an old towel. We then proceeded to clean the tiles with our favorite method. This consists of a microfiber mop and warm water with some Parsons Ammonia All Purpose Cleaner added. We were eager to do this test as we’ve always been somewhat skeptical about such fine textured finishes on interlocking tile. Needless to say, we were pleased to find that the tile cleaned up very well with no more than the usual back and forth of the mop. Results after mopping with a solution of warm water and ammonia. The white tile did require a little more attention due to the simple fact that the off color water that collected against some of the coins was easier to see. It required a second pass with a freshly rinsed pad. Additionally, we checked to see how slippery the tile would be with the slick ammonia solution applied. After testing with both hard sole and rubber sole shoes, we are pleased to report that grip was still really good. You can only purchase TrueLock HD Extreme garage tiles from Garage Flooring LLC. These tiles are a proprietary design that is not available anywhere else. Priced at an average of $1.00 per square foot less than other premium garage tiles, they are an excellent value. Garage Flooring LLC has an easy to use garage floor designer to help you determine your layout and design as well as a quick garage floor tile estimator. If you have any questions about the tiles, design, layout, or installation, just contact their sales staff. They have exceptional customer service and they can even provide some free samples for you to review for yourself. So, do we think that these are the perfect garage floor tiles? 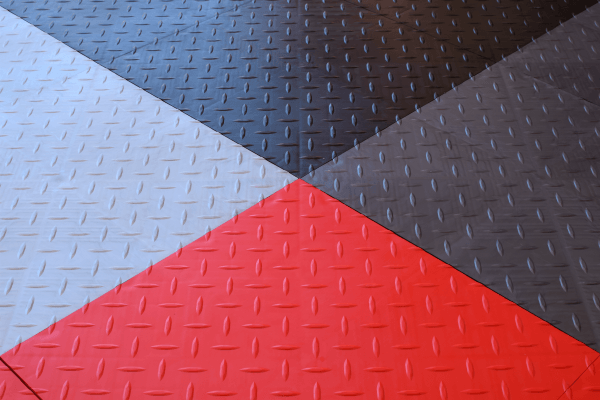 We think the answer really depends upon how you plan to use plastic modular flooring in your garage to begin with. 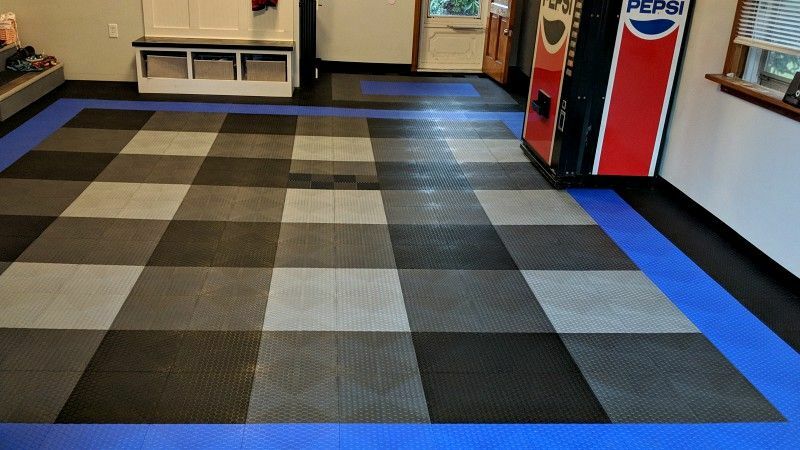 Justin Krauss, the owner of Garage Flooring LLC, designed the surface of these tiles based on his extensive experience from his many years in the garage flooring industry. We feel that he hit a home run with these two designs in terms of their functionality and looks. 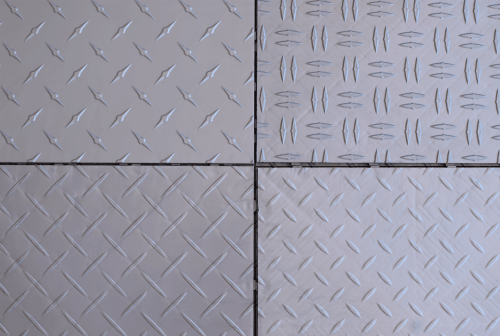 Are they the highest rated and most durable garage floor tiles in the industry? No, they are not. There are a couple of tile brands with stronger designs and higher load ratings that will stand up better to more extreme abuse. However, expect to pay an average of 40% more per square foot for those higher ratings. That works out to $1.00 or more per tile. That can add up quick for a standard 400-450 square foot 2-car garage floor. For the majority of people who purchase interlocking garage tiles with the expectation of performing routine automobile maintenance, wood working, accomplishing small projects, and other chores in their garage, TrueLock HD Extreme garage tiles are more than capable and extremely hard to beat in terms of performance and value. As with most any plastic tile design, they will work great under heavy storage cabinets, work benches, drill presses, table saws, washer and dryers, and most anything else that has a flat foot print. To be honest, there really is no perfect answer when it comes to garage flooring. There are always compromises that need to be considered. However, for plastic interlocking garage floors, we feel that TrueLock HD Extreme tiles are about as perfect as you are going to get in terms of performance and value for the average garage that sustains normal use.